These are 2 of the quilts that I completed for my customers this week The top quilt is a Terry Atkinson pattern pieces with many paisley fabrics and quilted with Highlight's thread from Superior Threads. The quilting is a freehand all over design of leaves and loops and some feather meander in some of the larger blocks to complement the paisley prints. when she refolded it it stretched even more, causing thin spots. 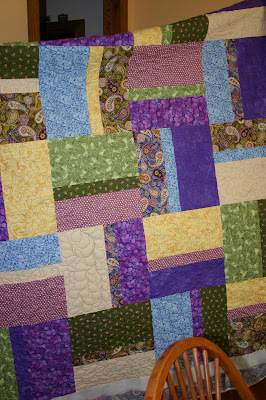 Lesson to learn, leave that batting in the package and just give it to your quilter! Second lesson, don't use plain, dark backs on light quilts! nice job kim!! the atkinson one is the same pattern of the quilt you did for me! 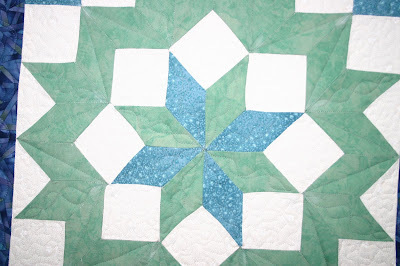 to date that & the batik one you did are the only 2 quilts i didn't quilt myself!